The Mongoose balance bike for boys is one of our favourite bikes that we have reviewed. The first thing that stands out about this bike is the frame, which is produced from natural birch plywood and offers an eye catching design. 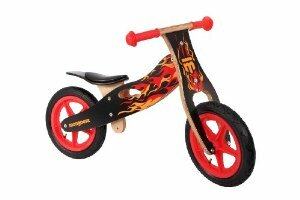 The wooden frame means that the bike is environmentally friendly, and the black background is complemented by flames along the side and on the front of the bike, and with red handlebars, 12 inch red aluminium wheels and a black saddle so this will really appeal to little riders who want to get on their bike. Other features of the Mongoose balance bike for boys include an adjustable saddle and pneumatic air tyres which provide a comfortable ride. Most leading balance bikes offer this style of tyre, although others such as Strider prefer the EVA foam tyre. The maximum weight of the bike is 3.5kg, and this bike will be suitable for children from age 3 and upwards as 2 year olds will struggle with the weight of the bike and the saddle height. If you are buying a bike for a 2 year old then check out our recommended bikes here.